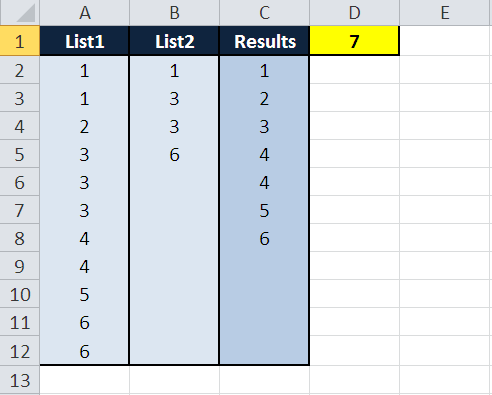 Blanks should be returned by the formula in rows beyond the expected number of returns. What’s more, this is to be done via reference to the value in cell D1, also to be derived, and whose value is equal to the total expected number of non-blank returns in column C.
What’s more, and perhaps more importantly, any solution is not allowed to consist of formulas which reference the results of formulas in previous cells. By this I mean that the formula in C3 cannot reference cell C2, the formula in C4 cannot reference either cell C2 or cell C3, etc. Also note that, as usual, the choice of range (A2:B12) was here made purely for display purposes and solvers should not think that it is fixed at such: theoretically, any solution should work equally well for a data range of e.g. A2:B1000. Which numbers add up to total? Then hopefully someone else can come up with a solution! Happy holidays! Not sure if this is what you want or not, but you do get the proper results with advanced filter using list1 as list range, list2 as criteria, copy to as c2, and unique records only checked. because they are all numbers and you told us list2 was included in list1. Actually that’s not a method I’d considered at all, mainly because I set these challenges with the idea that they be solved using worksheet formulas alone. I’m aware that there are often more efficient methods (e.g. VBA, helper-column set-ups, in-built features such as Remove Duplicates, Advanced Filter, etc.) to solve the task in hand, but I guess I’m interested in seeing what can be achieved using just worksheet functions, which I genuinely believe is more than most people realise. Still, yours is certainly the correct, practical choice. If it works, that is. Perhaps I’m not doing it correctly, but when I follow your instructions I get a result of (from C2 down): 1, 1, 2, 3, 4, 5, 6 which is obviously not correct. Both your count formulas are spot on though, so well done! Thanks again for your contribution and hope to hear more from you! I know you were going for a formula solution but I had to throw in the towel. My head started spinning to much so I had to give up. I’m probably gonna kick myself when I see the solution and realize just how close I really was. Thanks again. Ah! It should be simple, but this challenge is not as easy as it first appears…! where ‘k’ is a suitably sized row counter [at least MAX(list1,list2)]. and 's' is a suitable sized column counter [at least MAX(freq)]. In a way, I have failed the test because I usually use array formulas, which cannot be filled down cell by cell. I think my avoidance of all direct cell references is OK.